On Friday I was feeling a little shaky. So I went rambling around Friedrichshain in the just-a-bit-raw weather with Daria, and felt immeasurably better. this guy with a pink accordozylophone thing got on! As I drew the guy I could hear Daria’s voice in my head saying “Don’t overwork it!”, just as I hear the voices of my teachers and mentors advising me at so many moments. To be guided by the wisdom of artist friends is the best thing in the world. 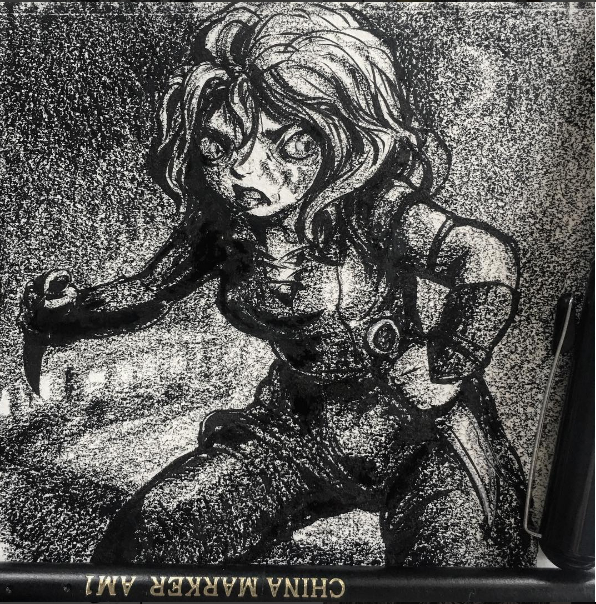 We got china markers when we went to Modulor, because I hadn’t one for decades; here’s Daria’s first china marker drawing! 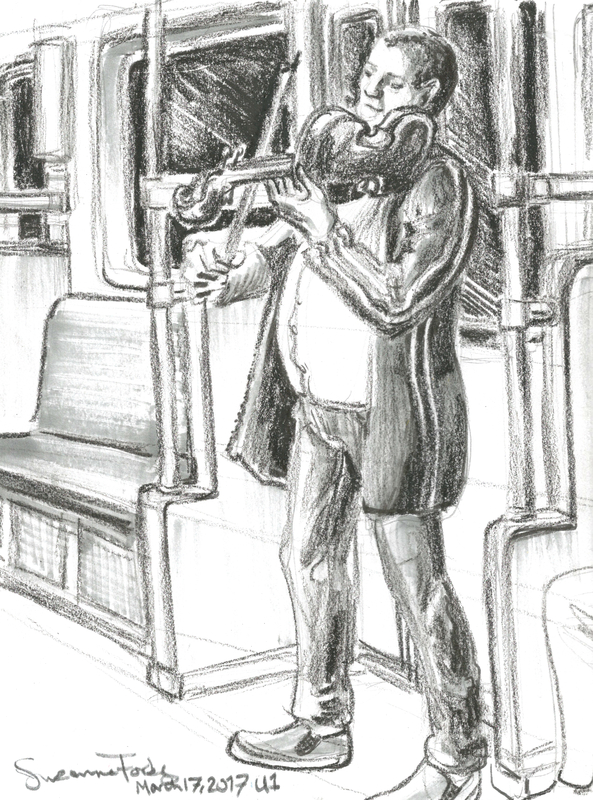 I used a mix of greyscale marker and china marker on the musician drawings. There is nothing, absolutely, nothing, like living and working around true peers for an artist. Yesterday we went first to look at a possible flat for her and the adorable auburn-haired English lad. It was a really gorgeous perfectly reno’d altbau, in the absurdly desirable neighborhood around Boxy, about 700 sq. ft., rent about $750. Yes, you should still move to Berlin. Changes in the law meant to control rising rents appear to have worked, and you can still get an incredible place for what seems like nothing. Then we went to Daria‘s tattoo studio Tremuschi Ink! It is the coolest place ever in the world, absolutely not kidding. Photo: Steffen Diemer, Model: Lexy Hell, Corset: Redcat 7. 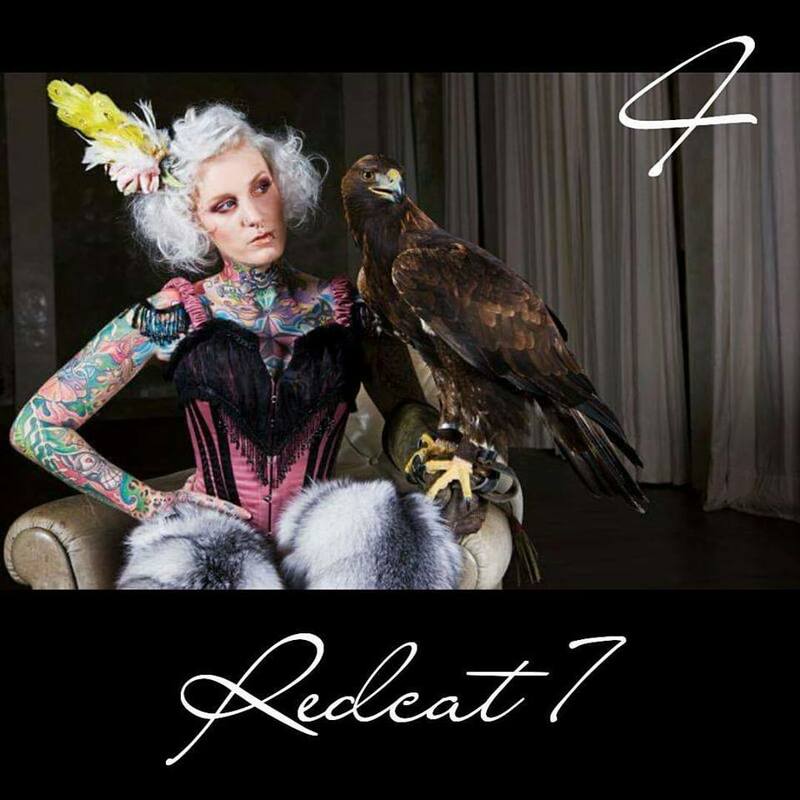 It is open in the front half to the incredibly charming handmade burlesque fashion design shop Redcat7, where a pink-haired gal manned the counter. One of the tattoo artists was working on sketches for a throw-up style tat; in the back Sammy, the designer and owner of Redcat7, was getting ready to be tattooed by Vivien. They have benches and a tattoo bed and rests of every kind, to tattoo any part of you comfortably, and a big lightbox for composing designs, and a screened private area. The walls are covered with framed art and there is a tag wall too. After we rifled through all the pretties at Redcat, we walked to Aunt Benny. It was a long walk, through all the charms of Friedrichshain, past the coolest shops and dive bars and eis cafes and music shops and print shops where people were making beautiful real screen prints like people do in Berlin. 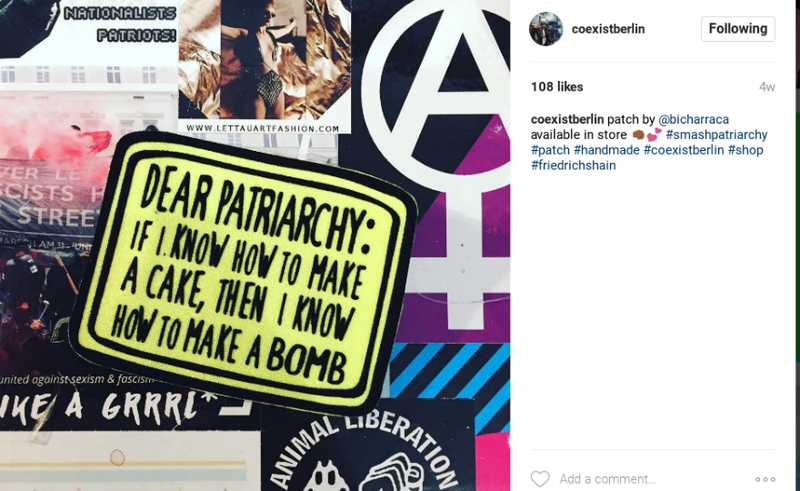 We had to go in to Coexist Berlin, a totally amazing punk pastelgoth alternative fashion shop for local and European designers. 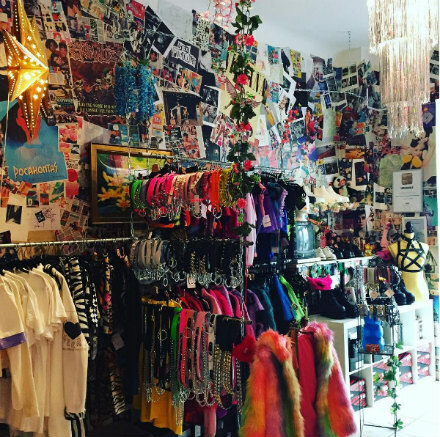 I told the lovely pastel-haired designer of Indyanna who was working that it was like a perfect flashback to Betsey Johnson’s first store in Soho, Manic Panic and Trash & Vaudeville in the 80s. Indyanna designs included a biker jacket lined with blue leopard and appliqued with blue glitter flames I badly coveted. I bought an insane Tyvek paper jumpsuit in Patricia Field in 1980 and it was just the kind of thing Coexist would sell. 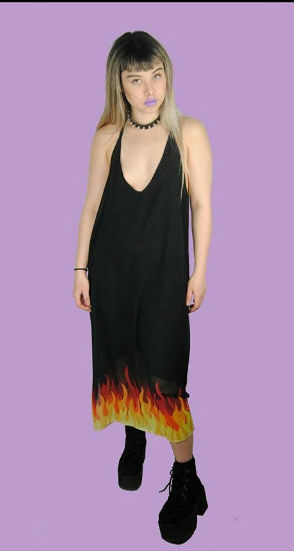 Daria wanted this mesh flame dress by The Ragged Priest for her next tattoo convention– comfy but rad! We arrived at Aunt Benny and met the lovely English girl Daria painted the last time she was there. I had mint lemonade since it was St. Patrick’s Day and we shared the really, really, really quite extremely good Carrot Ginger cake. Everything looked gorgeously fresh and delicious. We sat in a secret alcove in the secret corner room that you get to by going to the WCs. We discussed getting a visa so I could go to visit Moscow with Daria later this year and see the magnificence of her home town. This entry was posted in Berlin, My art, New York in the 80s and tagged "Glücklich in Berlin", 80s fashion, art in berlin, Aunt Benny, Berlin burlesque fashion, Berlin drawing, Berlin Friedrichshain, Berlin independant artists, Berlin independant stores, Berlin tattoo, cake in Berlin, Coexist Berlin, cool stuff in Berlin, Daria Rhein, drawing, drawing in berlin, Friedrichshain cool stuff, Friedrichshain tattoo, Indyanna clothing, life drawing Berlin., live drawing, pastelgoth fashion, portrait drawing, punk fashion, Recat 7, Suzanne Forbes, Suzanne Forbes art, Suzanne Forbes artist, Tremuschi Ink, unterwegs on March 18, 2017 by Suzanne Forbes. 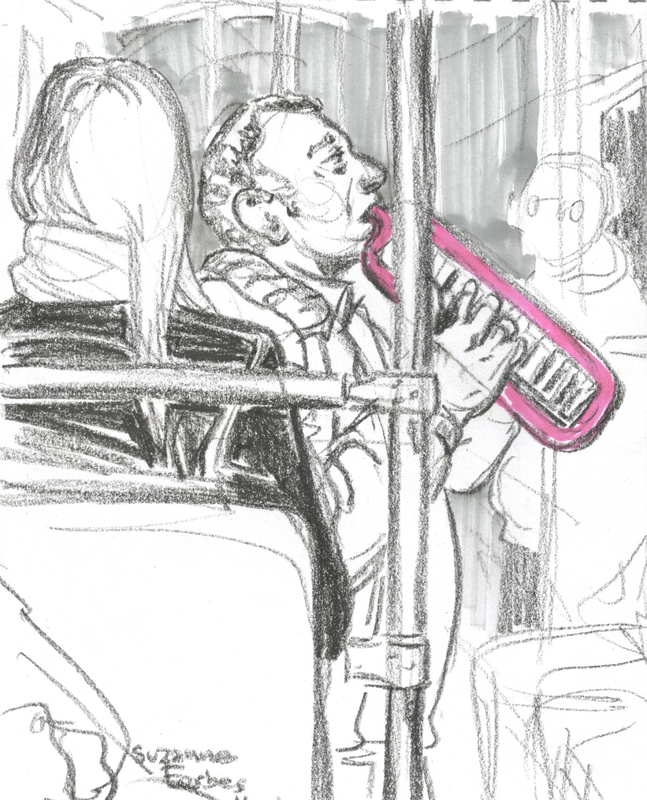 The pink accordozylophone thing is called a melodica! My mom has one. oh gosh! That is VERY helpful!